Let’s talk people pleasing. It has more to do with weight loss than you think. When we’re exhausted mentally and emotionally in other aspects of our life, there is little left to give to our weight loss goals. So this blog post is meant to help you see maybe just ONE piece of the puzzle. The better we can take care of ourselves, the better we can take care of others and just overall live the happy, healthy, meaningful life we truly want. Burned out because you feel the constant need to please other people? Do you let others walk all over you because you’re afraid to stand up for yourself? We’re sure there are people you respect because they don’t take nonsense from anyone. They’re not afraid to say no, and they do it with such poise and grace. So why do you feel such resistance when it comes to standing up for yourself? Burned out from the constant need to please others? Setting healthy boundaries is an important aspect of self-care. If you want to stop people pleasing, here are 6 ways to set boundaries in your life to reclaim your time and energy! Often we don’t say no to people because we’re afraid it might offend them or create tension in a relationship. We’re taught to be kind to others, but we ultimately need to find the balance between being kind and being firm. Otherwise, we give others permission to take advantage of us. When I set boundaries and stick to them, I find that I have more time and energy to put towards the things and people I love. Standing up for yourself and your time can make a huge impact on your well-being and life satisfaction. As this is a topic many of us struggle with, let’s discuss the art of boundary setting so we can spend less energy on people-pleasing. Many of us recognize that we are people-pleasers even though we don’t want to be. We say yes to parties we don’t want to go to, coffee runs that don’t fall under our job description, and weekend getaways with friends that we can’t afford. Despite not wanting to be a people-pleaser, you continue to fill the role because you don’t want to hurt people’s feelings. You don’t want people thinking you’re rude or disrespectful. The thing is that you’re actually disrespecting yourself if you continue to do things out of fear or a sense of obligation. There’s a fine line between being a good person and trying to make people think you’re a good person. You are *most likely* a good person, regardless of whether you do everything someone asks you do to. We know it’s hard to stick up for yourself when you don’t agree with someone or don’t want to do what they’re asking you. But you have to set boundaries with your time and your energy. There’s no need to deplete your emotional, mental, and physical energy on something that doesn’t align with your values. Setting boundaries might sound scary, but it gives you freedom to spend time doing what you love. Boundaries do not make you stuffy or boring. They allow you to create life on your own terms, which is the most liberating and exciting thing you could ever do. Communicating your boundaries to others (and yourself!) 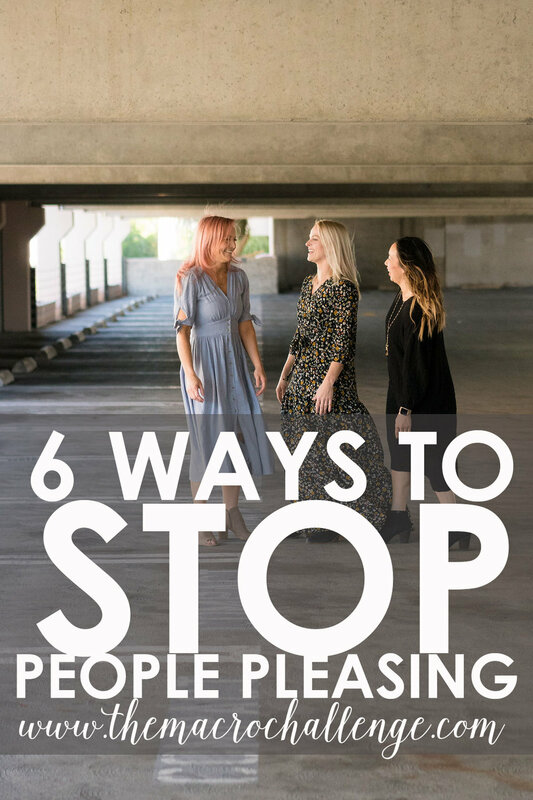 is a sure-fire way to make sure people-pleasing doesn’t take over your life. Getting clear on your priorities will help you figure out what you’re actually willing to spend your time and energy on. If you find yourself always putting other people’s priorities above your own, it’s time to change that. Here’s a quick exercise to help get clear on your priorities. If the people around you are always doing or saying things that frustrate you to your core, you have to put your foot down. People will never know that what they’re doing is unacceptable if you never tell them. Be that person who speaks up when people are behaving in a way that makes you feel inferior or unappreciated. If something doesn’t feel right to you, you should make every effort to avoid it. We will say this over and over until the cats come home, but your gut instinct is usually right. You know the difference between excitement and dread. Use that instinct help you make decisions. Don’t feel like you need to say yes to avoid hurting someone’s feelings. If you find it all too easy to try and make others happy, why not let yourself be happy for once? Make sure you spend time doing things that bring you joy and help you create better work-life balance. We all know that self-care isn’t selfish – it’s necessary to live a healthy life. Schedule self-care, downtime, and fun things into your calendar and treat them like an important meeting with a client. Schedule everything around these things and don’t cancel them! If someone asks you to do something and you don’t think you’re the right person for the job, offer an alternative. Recommend a friend, a co-worker, or some kind of tool that could help get the job done. If you hate being unhelpful, this option gives you the opportunity to be cooperative without having to take on the task yourself. Don’t let people talk you into or out of things. You can still be kind yet firm at the same time. Your friends might be bummed that you won’t make it to the party, but they should be able to get over it and respect your decision. HOW DO YOU SET PERSONAL BOUNDARIES? Remember that you are in control of your choices and your life. Don’t let other people dictate this for you. Set healthy boundaries and give yourself permission to do less people-pleasing. If getting to the bottom of who you are and what you value is just as important to you as weight loss, then our Macro Challenge is for you! We offer a workbook of 35+ pages as well as so many other resources during our challenge, that can help you stop letting others dictate who you are and how you view yourself. Time to put you first!